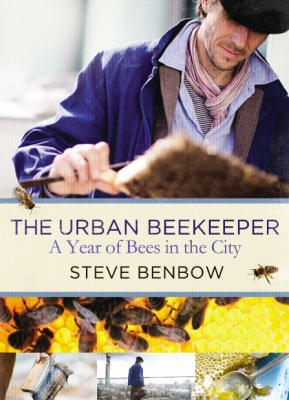 Steve Benbow is a professional beekeeper who runs the London Honey Company. He runs courses for beginners, sells high-end honey and beeswax products and looks after hives for prestigious companies around the capital, the likes of Fortnum and Mason and Tate Modern. Successful people are rarely popular with everyone, and Steve does appear to be a contentious figure amongst London beekeepers. I’ve heard him described as a ‘wheeler-dealer’, while some question how much of the honey marketed as ‘Fortnum and Masons’ and sold in the store is really produced on the rooftop – and whether bees should be kept high up on urban rooftops at all. (Edit 12/10: Steve has sent me a tweet to say “Thank you for my book review.. just for the record every jar of Fortnum’s rooftop honey is produced on the roof on their store”). Others greatly admire Steve’s charisma, charm and entreprenurial spirit. Deborah DeLong at Romancing the Bee has a fab blog post on her tour of Fortnum’s hives this year, ‘Tea With Fortnum’s Beemaster Steve Benbow‘. Check out the comments too for an interesting response by Angela Woods, secretary of the London Beekeeping Association. I tried to keep an open mind as I read on, and was pleasantly surprised at how quickly I was drawn in by Steve’s laid-back, humorous writing. This is not a beekeeping manual, but more of a diary of life as a professional beekeeper on the road, moving hives up and down the country in search of the perfect forage, racing between roof tops trying to prevent bees intent on swarming from doing so onto a nearby lamppost. Plenty of useful tips are passed on along the way; for instance, don’t inspect your bees at night because bees crawl up you rather than fly in the evenings. It’s clear that he’s not your average beekeeper – at one point he has an actress girlfriend whose name he later sees lit up in lights on a West End theatre. Dates are fitted in-between hours of heavy lifting, so that he often turns up scruffy and stinky – yet still it doesn’t seem like he has a shortage of interested ladies! But he does share with many beekeepers a passionate love for cakes, so much so that he lists his top five… and ‘cakes’ has an entry in the index. So, Steve’s top five cakes are: Battenberg, Jam tarts, Ginger cake (“can be moulded into balls and smuggled in through a tiny gap in the zip of the veil”, Eccles and Welsh cakes. I disagree with the book’s back cover claim that it “tells you everything you need to know about keeping bees”, but recommend it as a fascinating insight into a way of life that very few of us would have the stamina to lead. By the way, if you choose to buy this book or indeed any other items from Amazon, please consider going through the Bumblebee Conservation Trust’s Fundraising page. Each time you access Amazon.co.uk via their link and make a purchase this brilliant charity receives a donation worth 8% of your total purchase, at no extra cost to you. I was sad to miss the honey show too, but I’ve just started a HTML & CSS 10 week evening course on Mondays! Probably not going to the NHS as it’s a bit time consuming getting there by public transport, hope you enjoy your toiletries workshop! Oh no! I’ve spent so long trying to get my head round the National Honey Show programme that not only have my entries gone in late, but all the workshops that I fancied have sold out!!! Oh that is a shame 😦 Best of luck with your entries, very exciting that you’re entering! Thanks for this Emily. How much stress do you think the bees suffer when they are moved hundreds of miles to the “perfect forage”? Hi Philip, that is one of my reservations too, as I believe the distance and stress involved in trucking bees around the country is probably one of the reasons commercial US beekeepers have been hit by CCD. Having said that, it has been traditional for a long time for northern beekeepers to move their bees to the heather, and from reading Steve’s book it’s obvious he has a lot of affection and respect for his bees, and wouldn’t want to exploit them. The US situation is extreme, moving bees thousands of miles and must be enormously stressful for the bees. I didnt know about northern beekeepers but I am aware that Dartmoor beekeepers move hives to get the best forage. In either case the distances are not very great but I do wonder about moving hives tens to hundreds of miles. Me too. The number of beekeepers who do this in the UK must be very small. Thanks Deborah, that’s very sweet of you! A book I shall put on my list to buy when I begin my first steps into beekeeping. Exciting that you are going to begin beekeeping! This is more of a fun background book to read than a manual, so don’t expect it to cover the basics, but it should entertain you. I think you can move the bees to specialty forage (I hear carrot honey is amazing!) in a humane and low-stress way. But the North American (not just USA, Canada uses pollinator services as well) pollination services, under enormous economic pressure, do things to the bees that are simply shocking. Alas there is no insect welfare watchdog, an RSPI to protect the interests of bees. During a recent screening of “More than Honey” I was horrified to see that at season’s end, all the hives taken back to the pollinator service winter yard are completely disassembled, honey frames to the honey house (bees are crushed freely in the stripping line), and brood frames to a giant rack. The yard is thick with clouds of confused worker bees. Then hives are reassembled from random brood frames, empty frames, and requeened. The theatre, full of small holding beekeepers, was electric with shock at this care-less, brutal handling of colonies. Note that orchardists (also struggling to stay in business) and fruit/nut consumers are complicit in this process. That’s so upsetting. It can’t be good to mix bees from different hives up together, knowing how sensitive they are to smell. When Emma and I inspect our hives we get upset if we squash a single bee!